Lahore: Sports week of annual sports of School of Physiotherapy King Edward Medical University ended. Advisor on health Kh. Salman Rafiq gave away trophies, shields and souvenirs to the male and female students displaying best performance in sports. 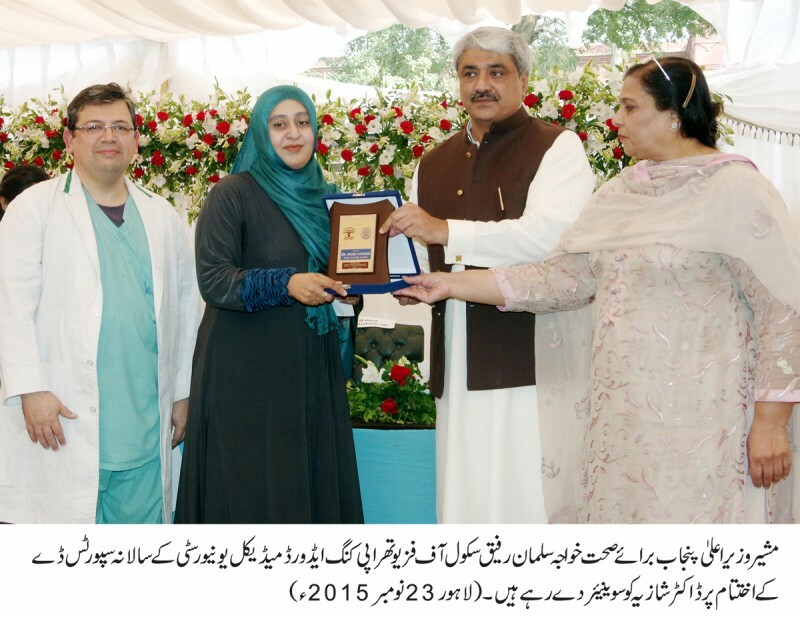 Principal of the school Saleh Saleem Bukhari, Dean Allied Health Sciences Dr. Asghar Naqi faculty members and a large numbers of male and female were present on the occasion. Speaking on the occasion, Kh. Salman Rafiq said that the importance and need of physiotherapy in human health is increasing. He said that modern medical research has proved that the treatment of a number of diseases is possible through physiotherapy without operation. He said that Punjab government is planning to set up rehabilitation centers at all divisional level in the province. He told that the rehabilitation center at Muzaffargarh has started work. Principal Saleh Saleem Bukhari narrated details about teaching program of the schools and identified the problems including hostel and paid house job for the students. Kh. Salman Rafiq directed the Principal to submit all problems in writing so that the work should be started on the problems of immediate nature and planning could be made for resolving long term problems.